Whisk the dry ingredients together in a large bowl. Using a food processor pulse the butter until it looks crumbly. If you don’t have a food processor, use a fork or pastry cutter and work the cold butter or shortening into flour mixture. Add egg and water, pulse until it just sticks together (don’t over mix). If dough is dry, add more water 1 teaspoon at a time. Wrap the dough in plastic wrap and chill for 1 hour. (If making a double crust, divide dough in half and wrap each half separately.) Remove dough from the refrigerator and place on the counter for 15 minutes. 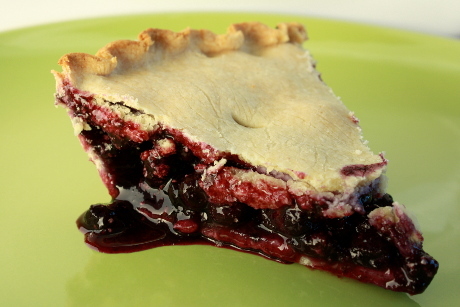 *picture shown with blueberry pie filling, because if I’m making pie around here… you can be pretty sure it’s going to be blueberry!